Fusilli is a type of pasta shaped like long curly spirals or little springs. Fusilli is traditionally served with thicker sauces. The word "fusilli" comes from fuso for a spindle, as a spindle rod is rolled over the pasta strips to wind them into the spiral shape. A variant of fusilli, called fusilli bucati, is made with hollow tubes of pasta that are twisted into little springs or corkscrews. There is also fusilli lunghi, which consists of long strands of spiral pasta, like the length of spaghetti, rather than short pieces. The word fusilli is sometimes incorrectly used to describe another twisted pasta called rotini. But the key to distinguishing the two is to remember that fusilli is made of strands of pasta twisted into little spring-like shapes, while rotini is a flat pasta that's twisted. However, it should be noted that manufacturers often don't make much distinction between fusilli and rotini. If you prefer one over the other, you'll have to examine what is in the box, bag, or container to see if it is the shape you were expecting. 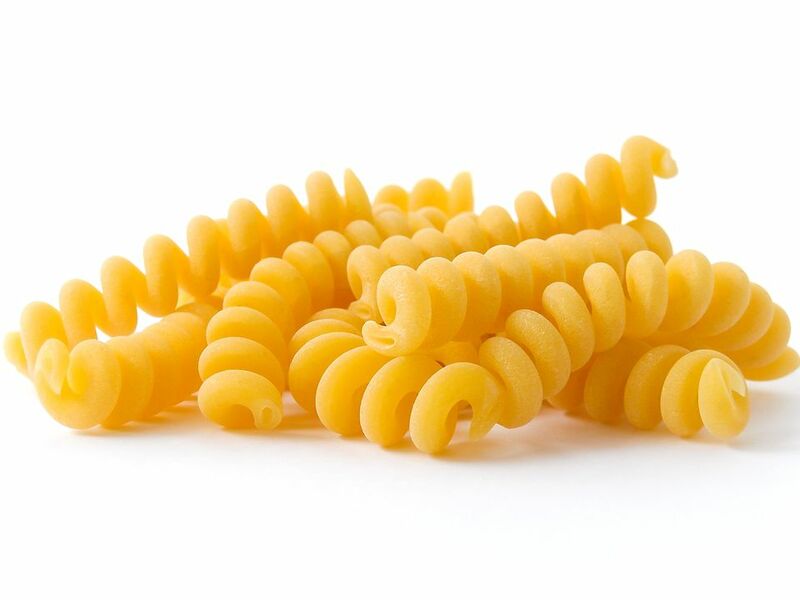 You may even discover rotelle (the little wagon wheel pasta shape) incorrectly labeled as fusilli or rotini. If you are very particular about mouth-feel and how a pasta shape holds a sauce, you may want to make your own or stick with a single brand when purchasing it. When ordering in a restaurant, don't be surprised to see fusilli and rotini interchanged. Fusilli makes a lovely cold pasta salad, especially with a creamy dressing. The twisted shape will hold more of the dressing in each bite for extra flavor while adding visual interest. It's also a great shape for holding thicker sauces, as with this Cajun Chicken and Pasta recipe. It can be baked in a casserole with meat sauce and cheese, either traditional Italian or this Loaded Pizza Pasta Casserole. To make fusilli at home, you first make pasta dough and roll it out to be about 1/8 inch thick, by hand or with a pasta machine. Cut strips of dough that are 1/4 inch wide and as long as you desire. About a 4-inch square may be best unless you want them to be long. Now take a metal skewer and wrap a strip loosely around it. Allow them to dry for several minutes, remove the skewer and let them finish drying for another 20 minutes or more. To make more rustic fusilli, roll a small dough ball into a strand about six inches long and then wind it around the skewer to dry. Pasta machines may have an attachment for extruding pasta in a rotini or fusilli shape. If you are very strict about the semantics, you'll have to decide which it is that your machine produces. You can make artisanal pasta using alternatives to wheat flour in cases where you are cooking gluten-free and for eggs if you are cooking vegan. You can also add coloring agents such as beet juice to turn the pasta red or spinach to turn it green. What is Marmalade and How is it Different From Jelly or Jam? What's Cracking With Organic Eggs? Are Fettuccine and Tagliatelle the Same? What Kind of Pasta Is Farfalle? How Do They Get the Hole in Bucatini Pasta? Why and How Does Barbecue Develop a Smoke Ring? Would You Choose Red Chard or Rainbow Chard?